Hippocrates was born about 460 B.C.E. on the island of Cos, Greece. Little is known about his life except that he traveled widely in Greece and Asia Minor, taught medical students at Cos and abroad, and was renowned during his lifetime as an exceptional physician. Although a few biographies of Hippocrates were written within several hundred years of his death, modern scholars regard these as fictitious. An anthology of 70 works concerning medical practice and philosophies makes up what is known as the Hippocratic Collection. Although the collection bears his name, Hippocrates probably wrote only six of the works. As the date of the earliest work in the collection precedes the latest (around 330 B.C.E.) by at least 100 years, the others were likely written by Hippocrates’ students and their followers. The works therefore vary in style and reflect many beliefs. They include such topics as anatomy, clinical methods, diseases of women, epilepsy, prognosis, surgery, and medical ethics. Many authors prescribe diet, rest, and exercise, rather than drugs, as disease treatments. Unlike previous medical doctrine, the authors of the Hippocratic Collection doubted that divine intervention was the cause of most diseases; instead they blamed natural and environmental factors. They suggested that diet and climate can affect the health of a patient. Hippocrates and his disciples advocated direct clinical observation and believed that a physician can predict the course of a disease after having witnessed numerous previous cases. They claimed that an effective healing method includes rational speculation. The theory of the four bodily humors—blood, phlegm, yellow bile, and black bile—appears in the Hippocratic Collection. The authors believed that health relies on maintaining a proper balance of the bodily humors. Hippocrates died about 377 B.C.E. in Larissa, Greece. Hippocrates’ scientific legacy rests on the doctrines outlined in the Hippocratic Collection, many of which dominated medical theory for centuries. Hippocrates transformed the basis of medical practice from religion to science. Prior to the introduction of his teachings, religious and magical beliefs dominated medicine in Europe. The Hippocratic traditions of observing symptoms and forming rational speculations moved medical methods in a scientific direction. Hippocrates’ position that diseases can have environmental causes stood in opposition to the belief that diseases are mysterious, malicious, unnatural entities. Modern scholars claim that the Hippocratic Collection probably belonged to the library at the Cos medical school, at which Hippocrates taught. The collection was likely passed to the library at Alexandria in the third or second century B.C.E. There the works were edited and then made available to medical instructors and students. 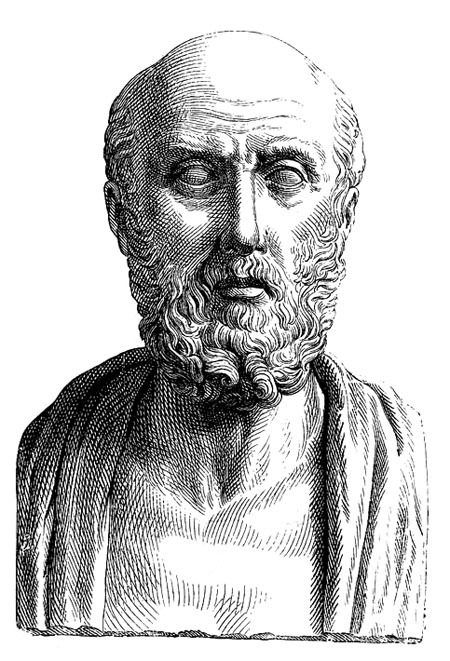 The Hippocratic doctrines were studied and developed by GALEN, a second­century Greek physician who practiced in Rome. Galen’s medical approach, heavily informed by the Hippocratic tradition but with more emphasis on understanding anatomy and physiology, was practiced for more than 1,400 years. Arab physicians systematized Galen’s work in the eleventh and twelfth centuries, and medieval Western universities instituted Galen’s views within their curricula. 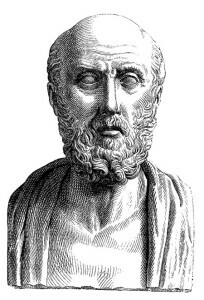 Hippocrates’ theory of the four bodily humors, accepted and promulgated by Galen, limited medical understanding throughout the 1,400 years of the dominance of Galen’s ideas in medical practice. Not until the 1500s, with the work of such physicians and scientists as ANDREAS VESALIUS and PARACELSUS, did such misconceptions begin to be dislodged. Many modern medical schools require graduates to take the Hippocratic oath, a promise embodying a code of ethical medical behavior. Although Hippocrates did not write the oath, his name lives on as a symbol of the ethics modern society values in its physicians. Hippocrates – c. 460­c.-377 B.C.E. Posted on March 8, 2015 by Natalie. This entry was posted in Physicians. Bookmark the permalink.